We recently added a solar system to our Lance camper. We love it, and we want to try and take advantage of the life-changing benefits it provides. The most important thing to attack is the drain of wattage in the usage of RV lights and systems. In our truck camper, this is extremely easy because generally, truck campers are constructed to be universally run on DC power (except for the air conditioner and the microwave). Even the television and stereo are DC powered, so converting to solar was super easy. In the picture at left, you can see that the new LED light is white and bright. I always thought it would be rather dim and bluish for some reason. Not at all! It's blindingly bright, you can't look directly at it! I was able to purchase most of the lighting on Amazon.com. There is a huge selection. 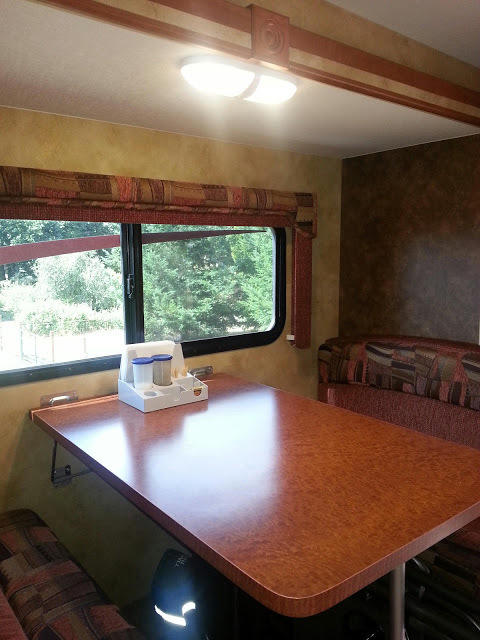 For the two florescent ceiling lights, I enlisted the help of the local RV repair shop. The proprietor took time with me and retrofitted our existing lights with an LED Kit that he had available (not cheap: $48 each!!) that basically stuck two rows of led strips where the old florescent tubes used to be. He removed the old ballast gear, because that is no longer needed. Then we just put them back up where they were using the existing wire setup. Piece of cake. It will be reassuring on our future trips to not feel too guilty when turning on the lights at night. They use a tiny fraction of what the old lights used, and don't produce heat. Such a huge improvement to our RV lifestyle!